Get the best out of your bath toys! We love bath time at Playgro! It is such a wonderful multi-sensory experience for baby. It also provides a lovely bonding experience for parent and baby. 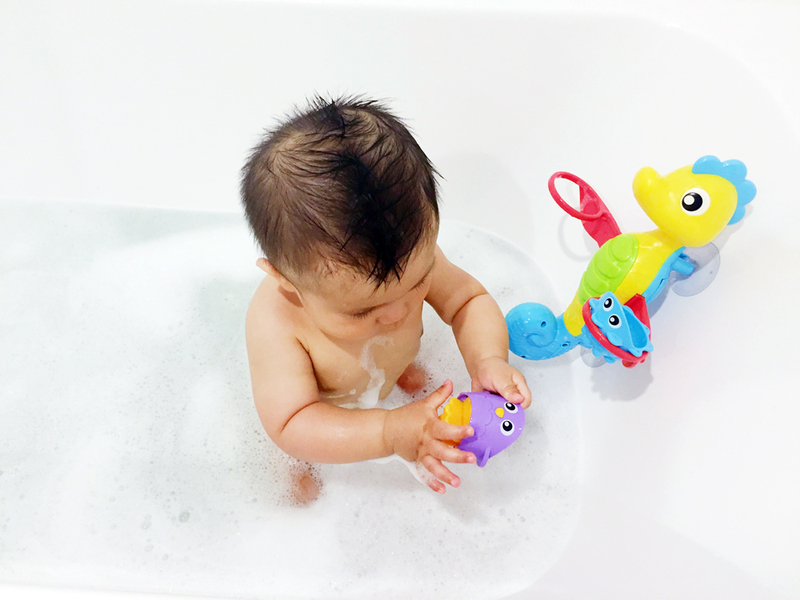 Bath toys provide lots of opportunities for bath time fun and to stimulate baby’s senses. Playgro creates some of the BEST bath toys for your baby – so we really want you to enjoy them for as long as possible. There has been lots of publicity lately about the bacteria and mould that can lurk inside bath toys. But before you rush off and throw them all in the bin or blast them all with bleach – you must read this! Wet, humid conditions are the perfect breeding ground for nasties. Let’s face it – if you let something sit around damp and wet – its condition will deteriorate and you are inviting trouble. Mould can cause respiratory difficulties, allergies and other health concerns if it’s not contained. While the risk is of a child becoming sick from mould is low for most children – those with allergies could experience increased coughing, itchy eyes, skin rashes or asthma. Babies love to put things in their mouths – so there is a very real chance that anything unhealthy inside their toys will make its way into baby’s mouth too. The solution is very simple though. Create a healthy environment to store your bath toys. Always remove bath toys from the tub when you are done playing with them. Give them a squeeze to remove any water trapped inside the items. Ideally place them in a well-ventilated space in a net or on a tray so they can naturally air dry. Some great options are our Splash in the Tub Fun Set (link) or Bath Squirtees & Storage Set (link). Make sure each toy has plenty of air circulating around it. If you want to remove all excess water – dry them off with a soft cloth. Make sure the bath room is well ventilated by running the fan for at least 20 minutes after bath time. Every couple of weeks – deep clean the toys by washing them in hot soapy water and a scrubbing brush. Rinse and then soak in a solution of water and vinegar. Vinegar is a mild acid so it is very effective at removing mould spores. It is also a fantastic natural alternative to harsh chemical cleaners. When done, rinse and air dry. Bleach or the Dishwasher? Hmmm…what is the first thing a baby will do once a toy is in its hand? Put it in its mouth. Sure – you don’t want your little one ingesting any mould or bacteria from inside a toy – but you also don’t want them ingesting bleach or dishwasher detergent either. No doubt the toys will come out squeaky clean – but we advise that you never do this to clean bath toys. If you find that some toys are really dirty and beyond help – then unfortunately the best course of action is to throw them out. 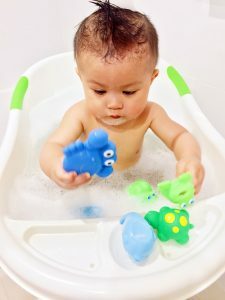 Baby will enjoy playing with Playgro bath toys for a long time if they are used and stored as advised. To see our great range of bath toys click here.